The Washington Jewish Music Festival returns June 3–15 for the 17th year and will feature international artists, family-friendly events and educational programs throughout Washington. A project of the Edlavitch Jewish Community Center of Washington, D.C., the Washington Jewish Music Festival (WJMF) is one of the largest Jewish music festivals in the country. 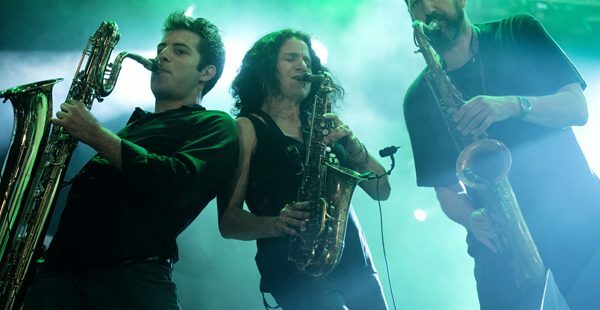 This festival lineup explores Jewish influences in diverse musical genres. Back by popular demand, Yemen Blues will open the festival on June 4 with music from Yemen and West Africa, with funk, mambo, soul, and ancient chanting techniques. Fronted by acclaimed vocalist Ravid Kahalani, Yemen Blues calls on a rich instrumentation that employs percussion, oud, horns, and strings and allows diverse influences to explode on stage. Basya Schechter of Pharaoh’s Daughter will perform acoustic adaptations of poetry by Rabbi Abraham Joshua Heschel. Her music will follow a screening of Every Word Has Power: The Poetry of Rabbi Abraham Joshua Heschel, a concert film shot at Lincoln Center featuring Schechter. Lesser known side-projects will complement big name acts, including a performance by the new Geulah Trio led by Jon Madof of Zion80 and an exploration of Moroccan music in America presented by Samuel Torjman Thomas of the New York Andalus Ensemble hosted at the Library of Congress. 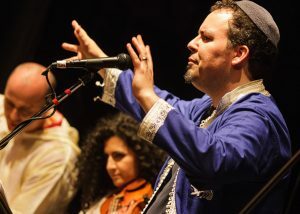 Sephardic singer Sam Thomas with his New York Andalus Ensemble at “Young Traditionalists: Rocking Their Roots” at the Brooklyn Music School, for “The Sweetest Song Festival” with Brooklyn Arts Council. (Photo by Anna Mulé. Family programming includes the 4th Annual Day in the Park, a musical celebration at Stead Park on June 5 featuring The Macaroons’ catchy pop-rock mixes with The Brothers Yares’ Middle Eastern-inflected Folk and Americana sound. The day includes face painting, games, and workshops and is free and open to the public. The festival closes with The Community Education Evening on Arab Citizens of Israel featuring a concert by Jewish-Israeli cellist Udi Bar David, Arab-Israeli violinist Hanna Khoury, and Venezuelan-Syrian percussionist Hafez Javier Kotain. The musicians will participate in a moderated conversation on the power of the arts in building a shared society in Israel. Ticket sales are open and patrons are encouraged to purchase tickets online. The WJMF offers festival passes for $75 and passes for patrons under the age of 30 for $30. The Washington Jewish Music Festival (WJMF) is the flagship event of the Edlavitch JCC’s year-round music program. Established in 1999 with a lead gift from the Howard and Geraldine Polinger Family Foundation, the WJMF promotes appreciation of Jewish culture and connects the Greater Washington community through music. WJMF presents extraordinary performing artists, educational programming, and free events, and engages the DC community in cross-cultural dialogue. Follow @JewishMusicDC on Twitter and Facebook.com/WashingtonJewishMusicFestival on Facebook for updated festival information. Join the conversation using #wjmf2016 on social media. The Edlavitch JCC of Washington, DC preserves and strengthens Jewish identity, heritage, tradition, and values through a wide variety of social, cultural, recreational, and educational programs and services. The Edlavitch JCC is committed to welcoming everyone in the community; membership and all activities are open to all. The Edlavitch JCC is a partner agency of The Jewish Federation of Greater Washington and a designated agency of the United Way. Follow on Twitter (@16thstreetj), like on Facebook, and find more information online atwww.washingtondcjcc.org. The WJMF is part of the Morris Cafritz Center for the Arts at the Edlavitch JCC, which presents fresh, pertinent, and provocative Jewish voices to address issues both contemporary and universal. The Edlavitch JCC embraces inclusion in all its programs and activities. We welcome and encourage the participation of all people, regardless of their background, sexual orientation, abilities, or religion, including interfaith couples and families.